Representative Projects | Paradigm Consultants, Inc.
At Paradigm, we are proud to offer the skills of highly-qualified specialists to a wide variety of development industries. Our geotechnical and materials engineers work with other certified, registered technicians and experts to provide structural assessment, planning, review, and repair support. Satisfied clients throughout the history of our consulting firm attest to the fact that our specialists have the skills and the equipment necessary to help you meet your development project goals. These various projects demonstrate the impressive array of skills and services we can bring to any developmental enterprise. [Firm-name] can connect you with many different engineers and specialists to fill a variety of general building needs, but we can also help you with specific, pre-set design, planning, and assessment tasks. ruction. This necessary environmental and geotechnical support made this expansive project possible. 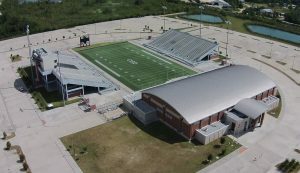 We also provided materials evaluation, monitoring, and testing for the stadium seating, press box, concession stands, restrooms, pavilions, and other building and parking lot features. If you have your own development project in mind, you can use the guidance and assistance offered by an experienced, decorated consulting firm. Contact Paradigm Consultants, Inc. today to get access to our qualified professionals, their services, and their state-of-the-art equipment. Call us at (713) 686-6771 to learn more about how we can support your construction, design, renovation, maintenance, or repair project.